Good PoultryMr W Clarke, of Rushden, secured 1st and special prizes at Harpenden Horticultural and Ornithological Show on Monday for the best Leghorn. At Leicestershire Agricultural Show at Melton Mowbray on Wednesday he secured another first prize. Irchester - Mr. J. E. Parsons’ farm has been selected for the ploughing and hedge-cutting competition with the Northamptonshire Agricultural Society on October 17th. The Show Committee, having accepted the invitation of the Council to hold their Shoe at Rushden this year, I have been requested to convene a Public Meeting for the purpose of appointing a Committee to make all necessary arrangements, to be held at the Council Chambers on Monday, the 24th instant, at 7.30pm. All persons interested are invited to attend. Two Royal visitors to Rushden in two months is an honour which will make 1927 memorable. 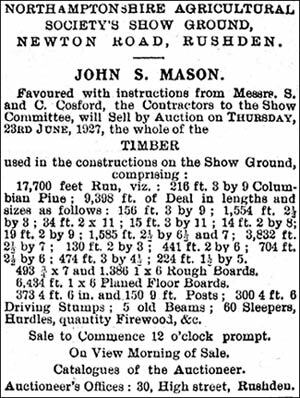 This will have happened by the time the County Agricultural Show is heldnamely, on June 9th, the Thursday in Whit-week. Her Highness Princess Helena Victoria came to Rushden on the Thursday in Easter week. In 1923 Prince Henry visited the County Show at Kettering, and he has consented to pay another visit when the show comes to Rushden. Mr G H Drummond, of Pitsford Hall, who is much interested in the show, has been instrumental in getting the Price to consent to visit the show again. The last visit of Prince Henry to Northamptonshire Agricultural Show was the occasion of an enthusiastic “mobbing” by the delighted crowd of thousands of spectators, all of whom wanted to get within arm’s-length! It is fairly certain that Rushden people will not be outdone by the Kettering crowds in giving the Royal visitors a royal welcome. It will need but the kind of weather which greeted the visit of H.H. Princess Helena Victoria to Rushden to ensure perfect success for the event and the happiness of the thousands who will endeavour to be present. The Prince last visited the county in July 1926, when he inspected the Boys’ Brigades at Northampton.